Morgantown, WV- Kindred Communications has become one of the West Virginia’s most honored radio broadcasters, in 2018. 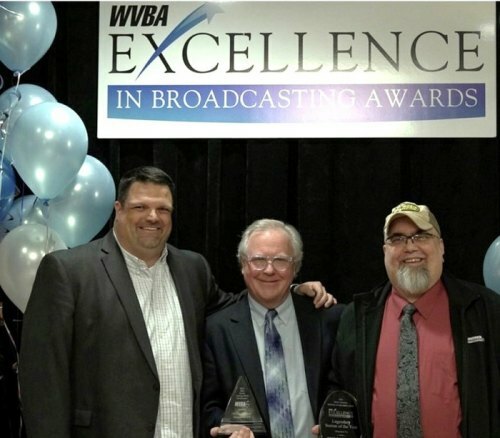 The locally owned company received multiple awards, from the West Virginia Broadcasters Association, during the annual WVBA Awards ceremony, Saturday, March 24th, at the Morgantown Marriott. Mike Kirtner, Kindred Communications, Inc. President and General Manager, was awarded the “Mel Burka Most Distinguished Broadcaster Award,” during the ceremony attended by both radio and television management and staffs. “Being recognized by my peers is the greatest honor of my life,” Kirtner said. Additionally, KCI radio stations, WCMI-FM/92.7 & 98.5 “The Planet,” won the “Best Rock Station of the Year Award” and WDGG-FM/93.7 “The Dawg,” was recognized with the highest honor for any radio or TV station, in the state of West Virginia- the “Legendary Station of the Year Award.” “During the past two years, our KCI stations have received awards for being the Best Rock Radio Station, Best Country Radio Station and the Legendary Station of the Year,” Kirtner added, “Our locally owned and operated station group is fortunate to be partners with a great staff and community.” Kindred Communications, Inc. is a locally owned and operated radio and multi-media group, in Huntington, WV. Featuring radio stations WDGG-FM/93.7 “The Dawg”, WXBW-FM/Big Buck Country 101.5, WCMI-FM/92.7 & 98.5 “The Planet”, WMGA-FM/97.9 “The River”, WCMIAM/Cats Sports 93.3 & AM 1340 and WRVC-AM/ESPN 94.1 FM & AM 930. “The Insider” monthly magazine and Kindred Digital.